It’s Sunday on 17th April 2016. This morning we have an ample of time before we start our tour. After I woke up, I head downstairs to have a breakfast in the hotel’s restaurant. 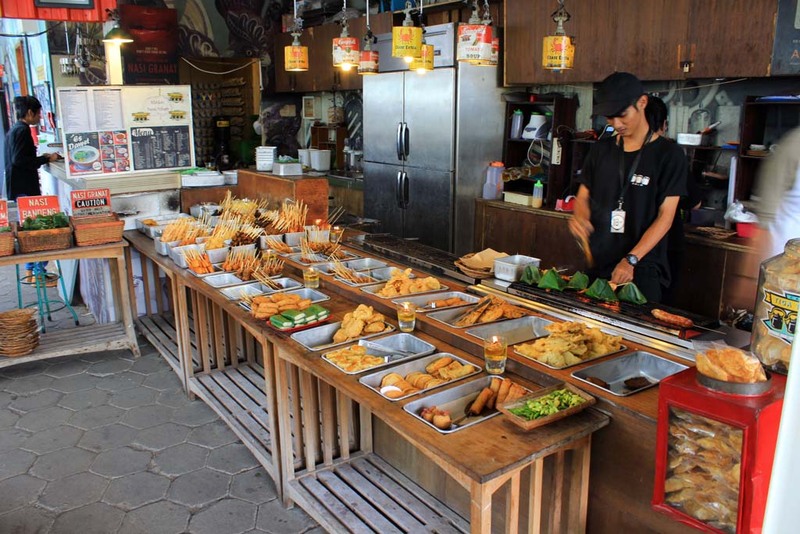 The restaurant was very packed: there was group of people from Jakarta who were vacationing in Surakarta, and all of them had a breakfast together. So the restaurant was really packed, and I struggled to find seat. I look at the breakfast buffet menu, and quite disappointed by the lack of variety. Yes I know it’s a budget hotel, but they supposed to provide some lighter items that my stomach can digest in the morning. So I took sausage and potato that they served. 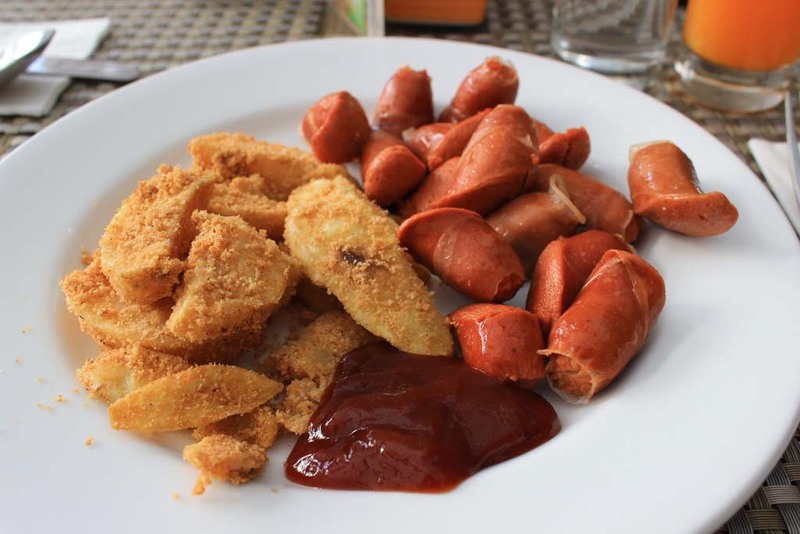 The sausage is just mediocre, while the potato is just too starchy. 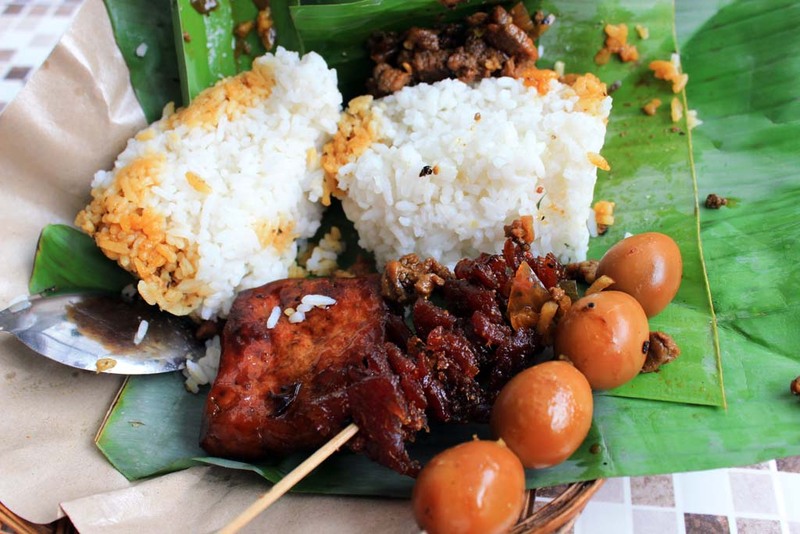 After I finished my breakfast, I head out to the jalan Slamet Riyadi main street nearby to see the Car Free Day event. 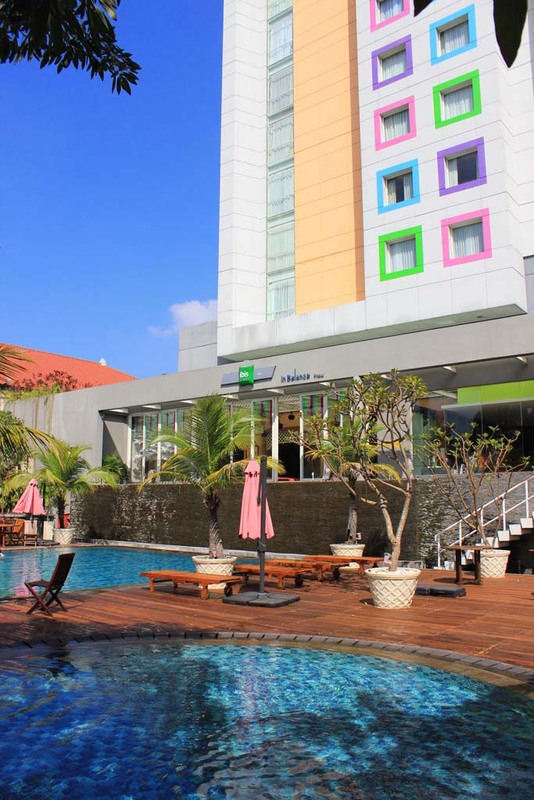 Upon walking out, I can see the Novotel hotel which is located just next to our hotel. 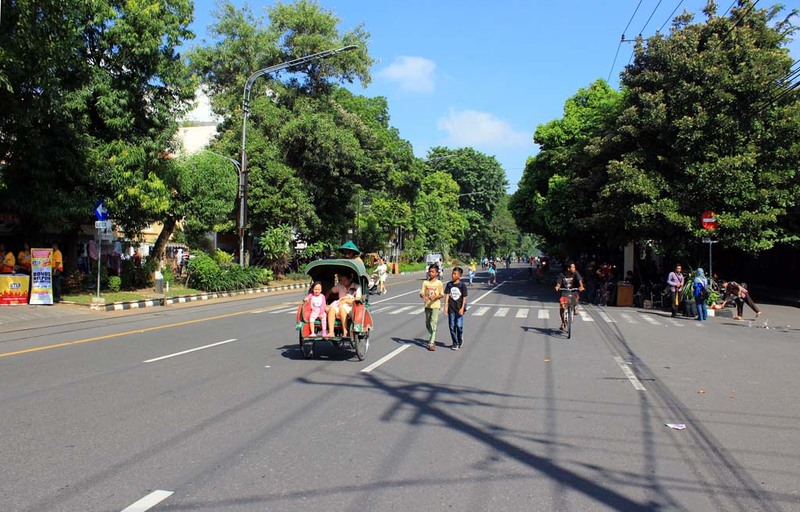 Every Sunday, the main thoroughfare of Solo is closed from motorized traffic and used as pedestrian area. 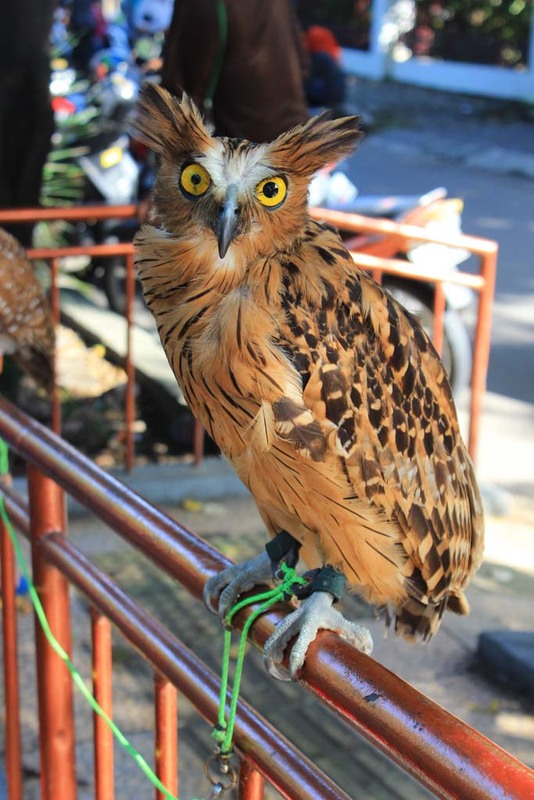 The occasion is used by local communities to showcase their stuffs, such as this peregrine falcon. 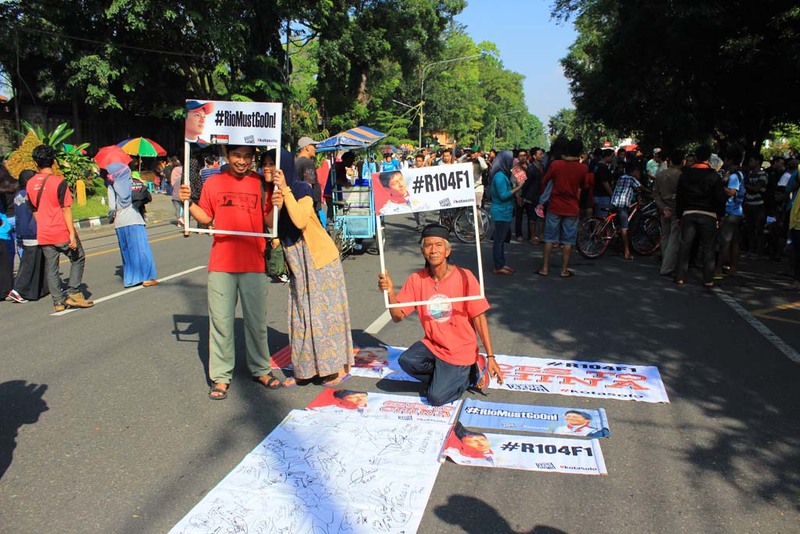 There are also some people who asked for signature from passersby to support Indonesia’s first Formula 1 racer, whom himself is also native of Surakarta. 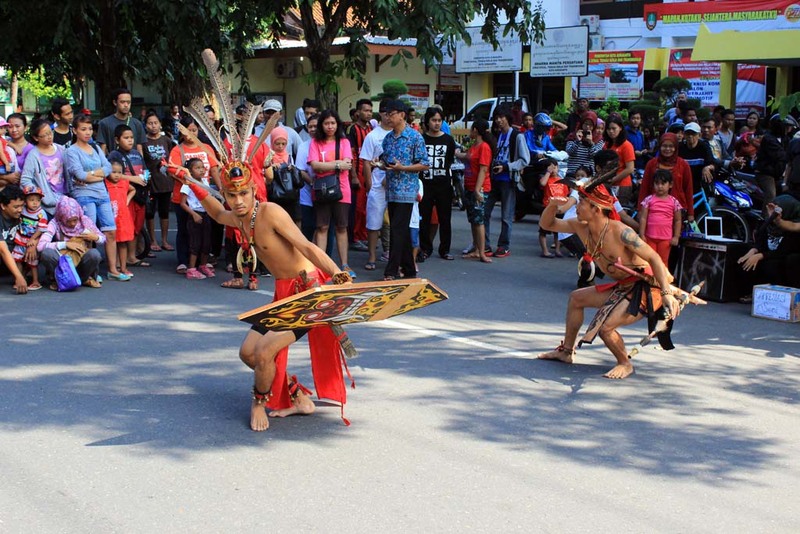 In some places, there is also some traditional dance performance, such as this Dayak dance from Kalimantan, performed by Kalimantan students who studied at the local university. But other than that, we can just simply walking around in the middle of the street and enjoying the quietness of this city, a trait that this place was once known for. 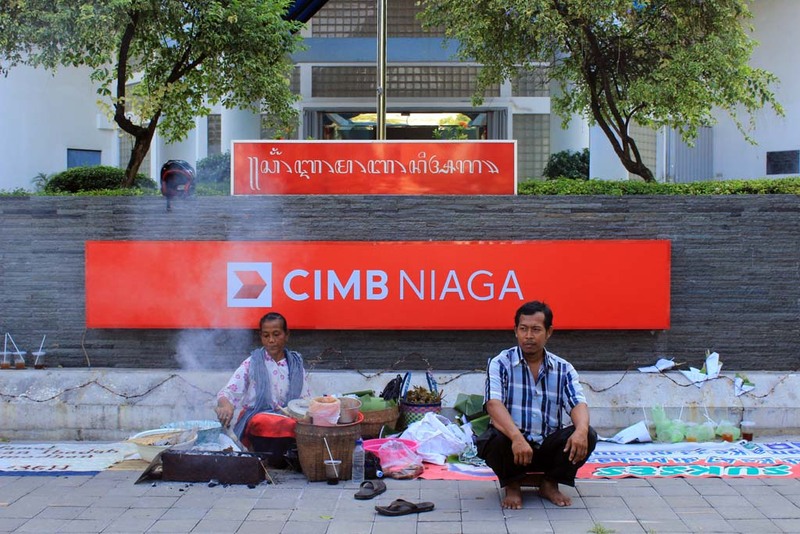 Some traditional food vendors also using the opportunity to sell their foods or merchandise, such as this old lady who sell satay. After withdrawing my money in the bank, I head back to the hotel where on the way I catch up with Christophe who has also returning from Car Free Day. He is impressed by the way such event is held, as he never saw such thing in Bangkok. We are returning back to the hotel soon after. 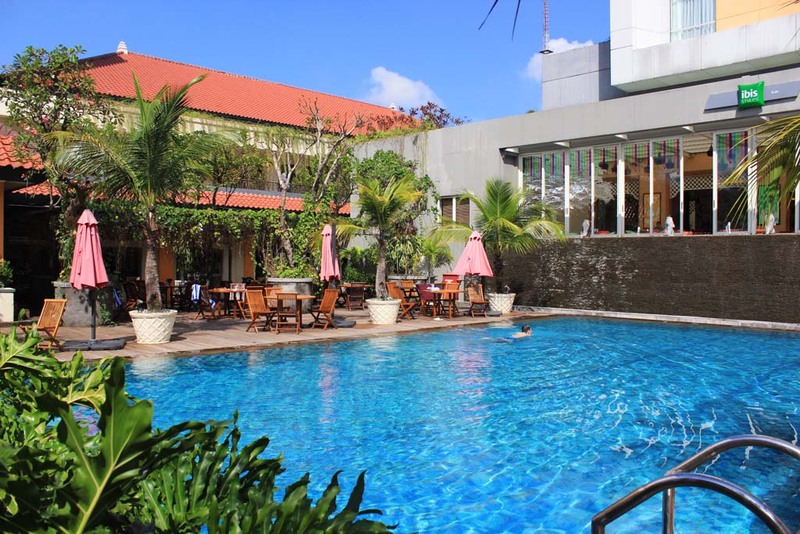 And upon arriving at the hotel, some people can be seen swimming in the hotel’s pool. 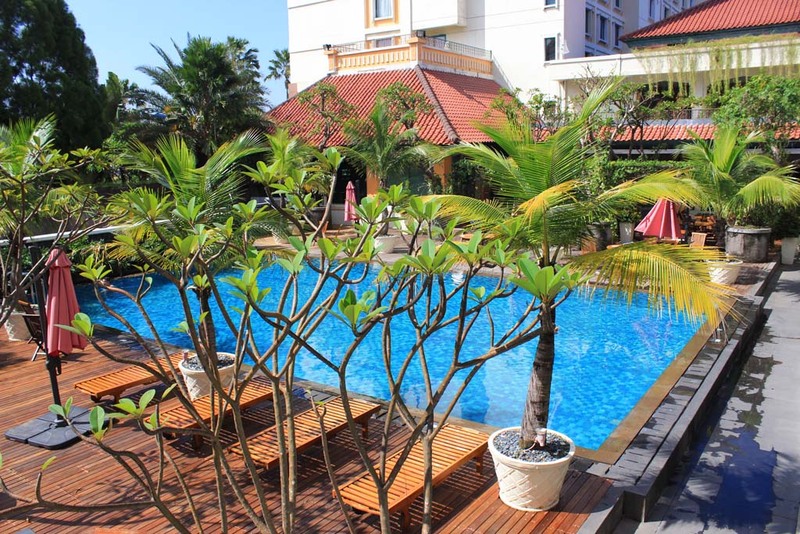 It looks like a nice time to have a dip in the pool, but our tour starting time is near, and beside that we didn’t bring any swimming trunk with us. 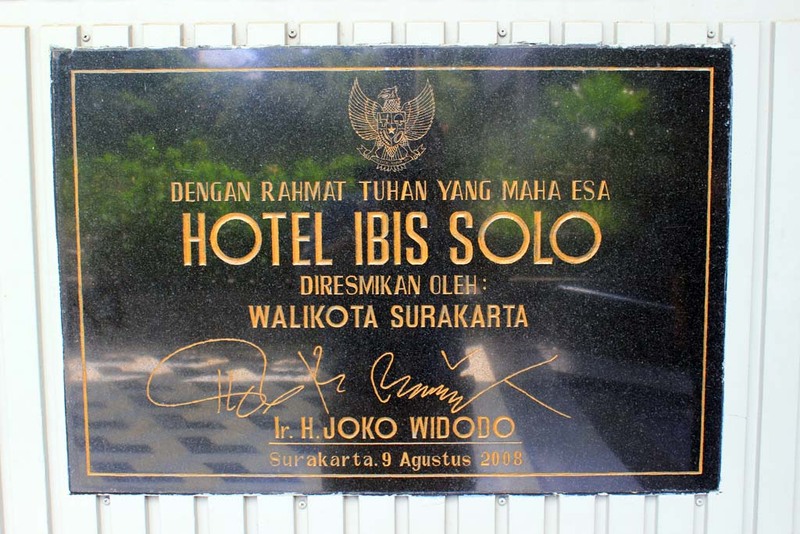 When we are about to enter the hotel, we saw this sign, which say that this hotel was inaugurated by Mr. Joko Widodo. 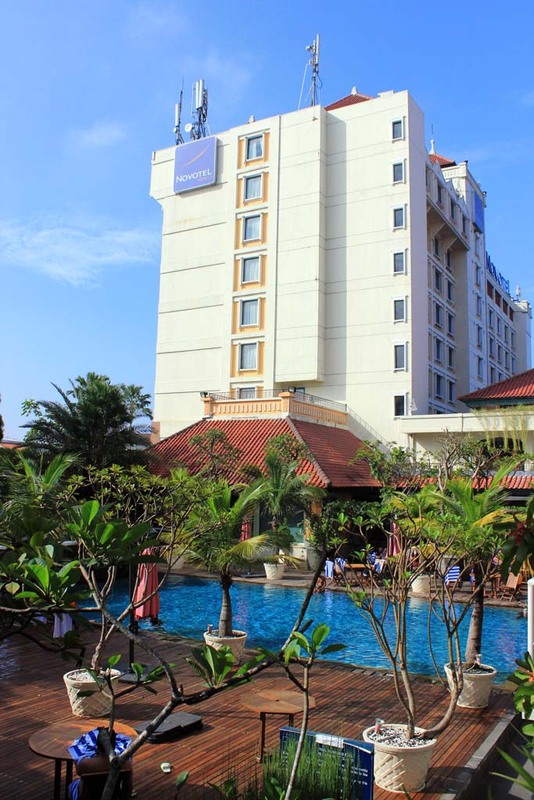 He was the Mayor of Surakarta at the time this hotel was opened in 2008, and now he is the President of Indonesia! Upon returning back to my room, I had a shower first. My body was drenched in sweat, as if I was melting! 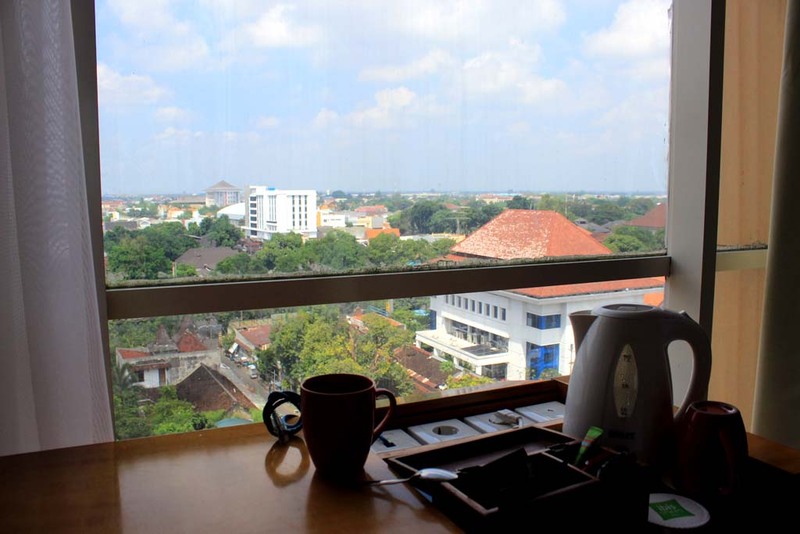 After I finished shower, I sat on the working table in the room and enjoying the scenery. 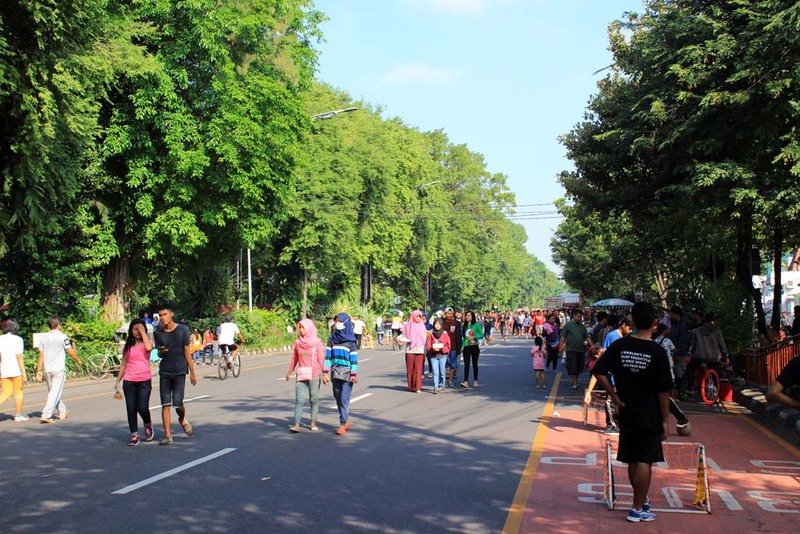 It was already past 9am, and the car free day have ended and the road reopened for motorized traffic. Yet somehow I also see a group of protesters walking down the street. I was wondering what they were up to on Sunday? 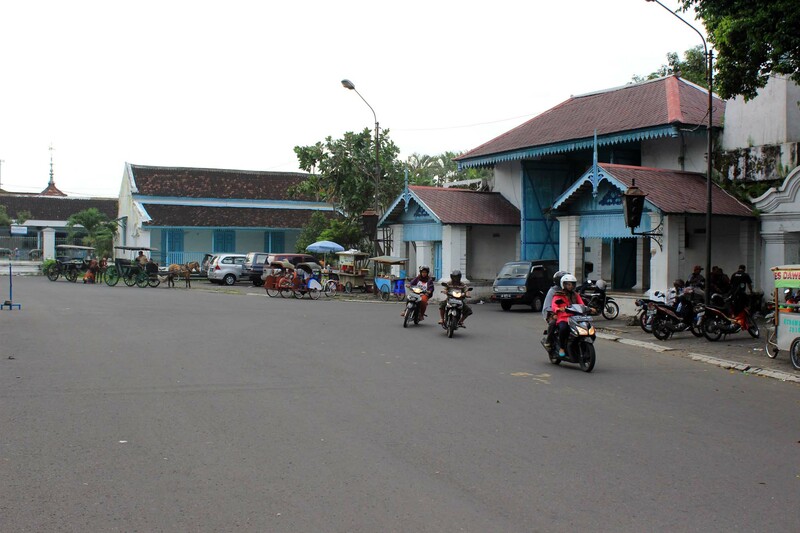 And one unique feature of jalan Slamet Riyadi is the fact that not all motorized vehicle that passing through the street are road vehicle. 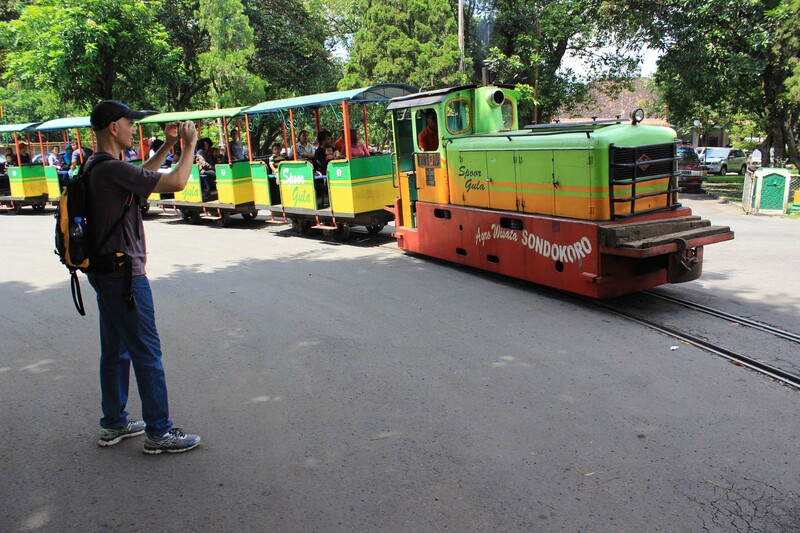 Every day there is also a railbus from Wonogiri who plying the street running section. It’s still 20 minutes to go before the tour commence, so I sit back and relax while enjoying the scenery out there. Once the tour commencement time near, I dressed up and head to the lobby where Cristophe and his girlfriend later come and meet me. Our car arrived on time at 10.30am, and we head straight to Tasikmadu sugar mill. It wasn’t very difficult to go there as the road are rather empty. 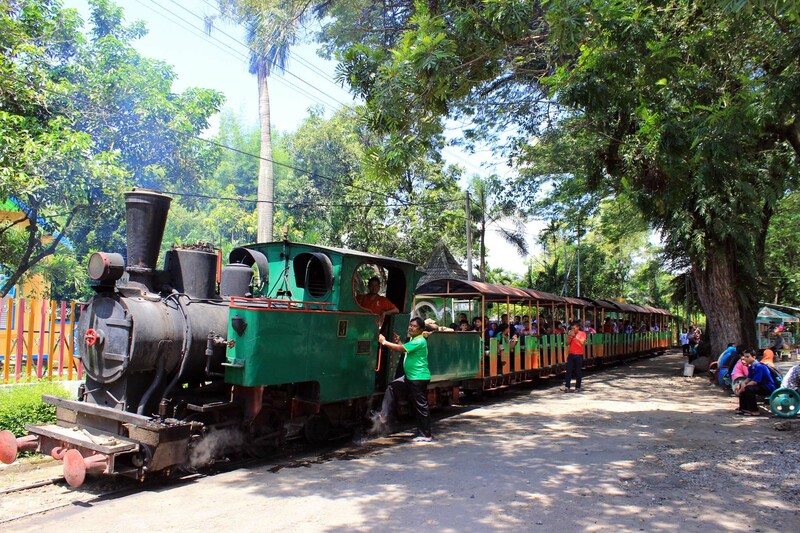 Upon arriving there, we were greeted by the steam locomotive who hauling tourist coaches. 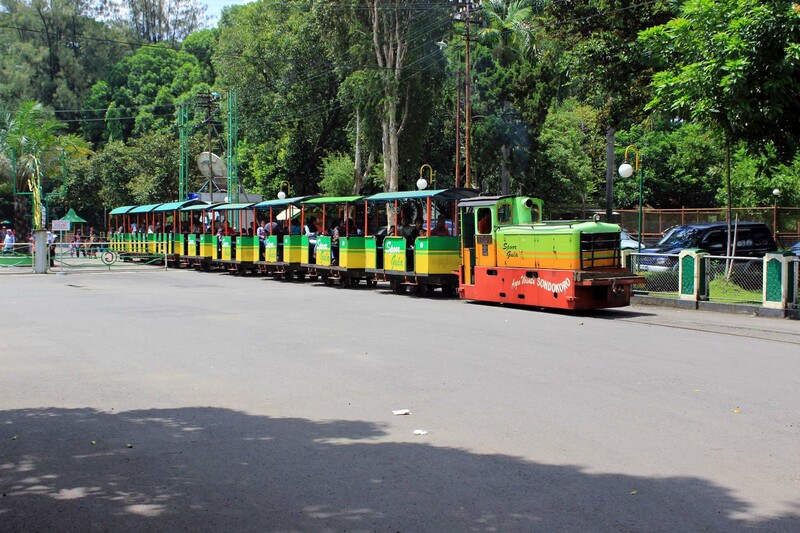 Interestingly, unlike my last visit in here, this time they reverted back to the old open air coach for the tourist train. Where are the VIP coaches? 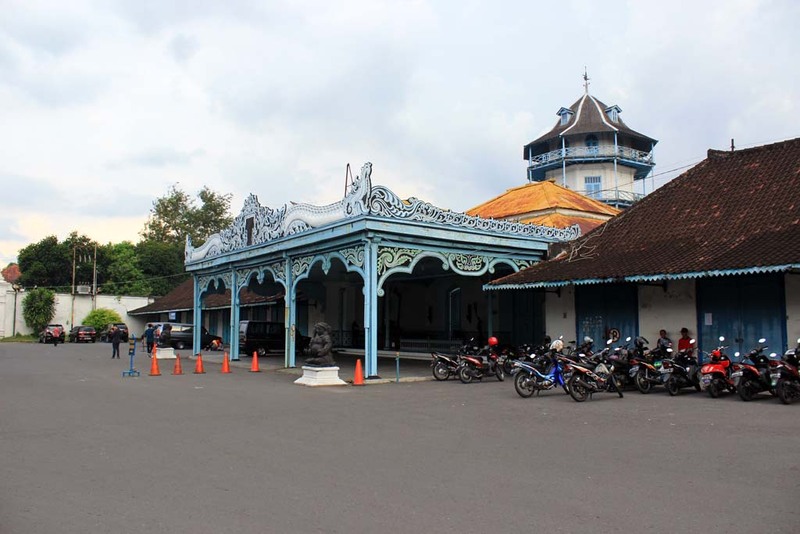 Upon arriving at the gate, we were greeted by pak Megantoro, the head of the theme park, and also my friend who lives nearby: Ariawan Sulistya. He is glad that I can return back to his theme park again. And Ariawan is also happy that he can finally accompany me again, after some failures to catch up in my previous visits. 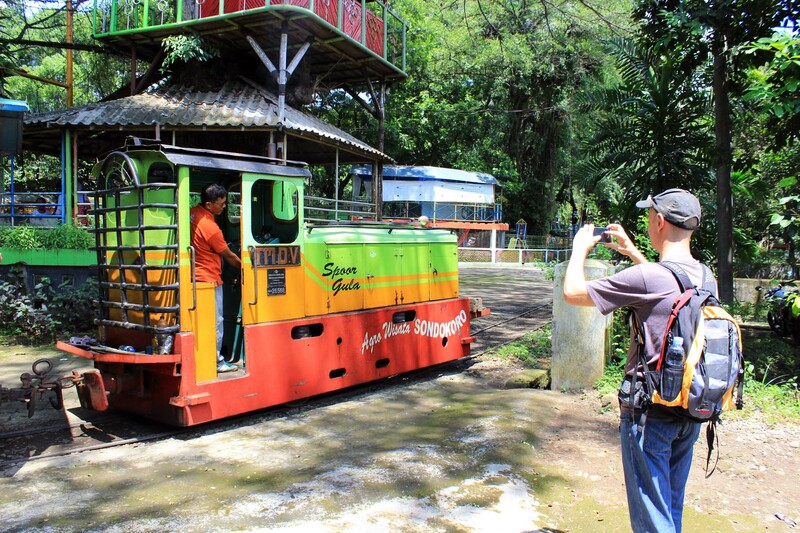 He is showing us that all of the locos in the park have recently been repainted. 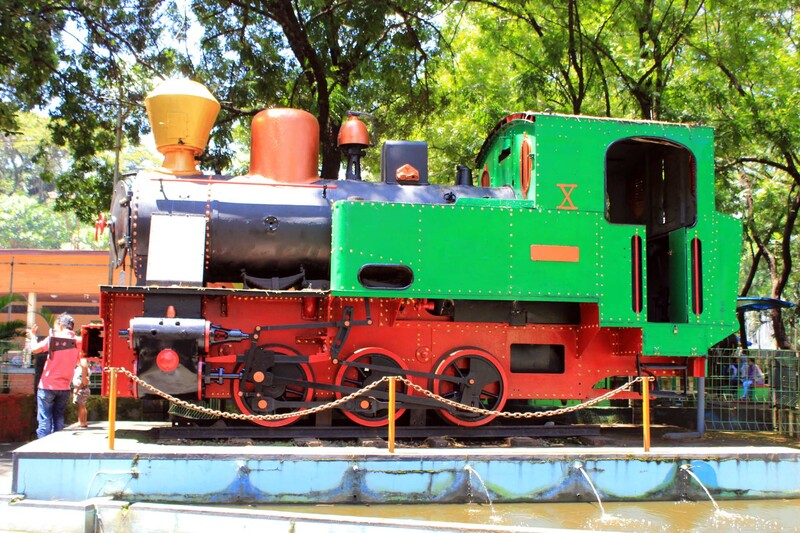 He said that the color selection was done with the consultation with German railway enthusiasts who happen to know the loco’s original color. 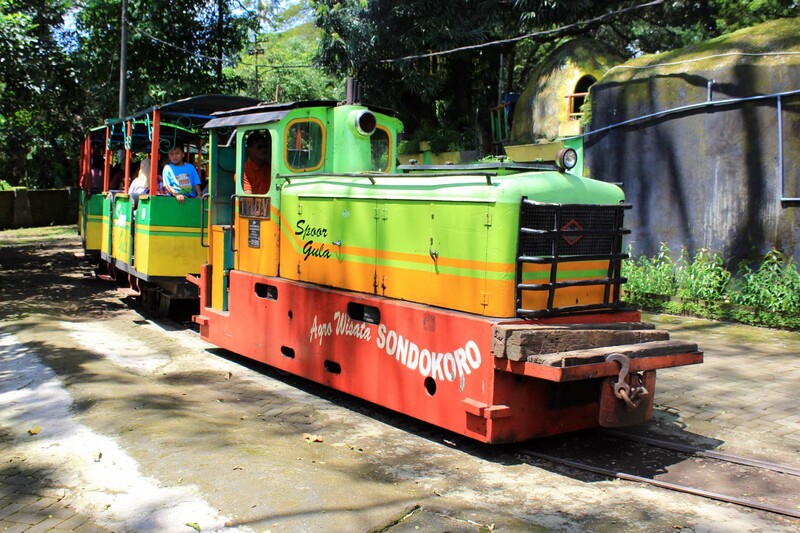 Apparently to “Doon” tram engine have also been repainted with the similar color. 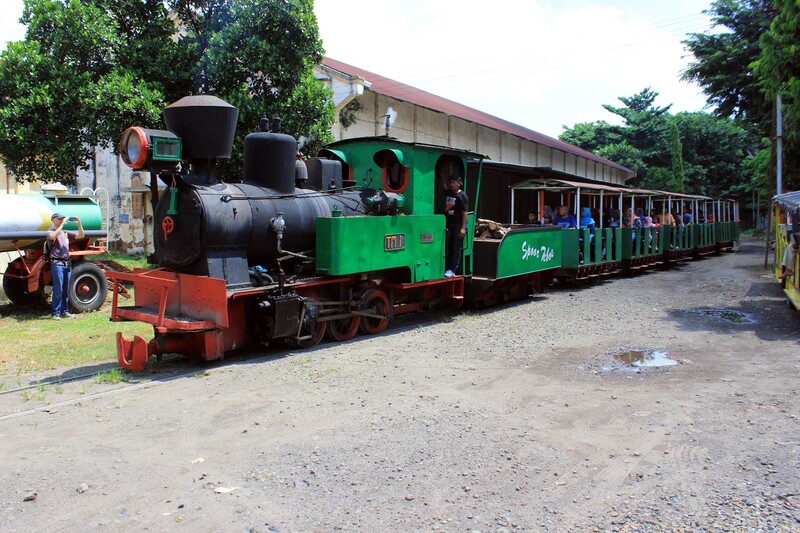 Just for your reference, this engine is the twin of “Si Mbah” that we saw in Gondang Bar, unless it was withdrawn much earlier, probably in 1950s. 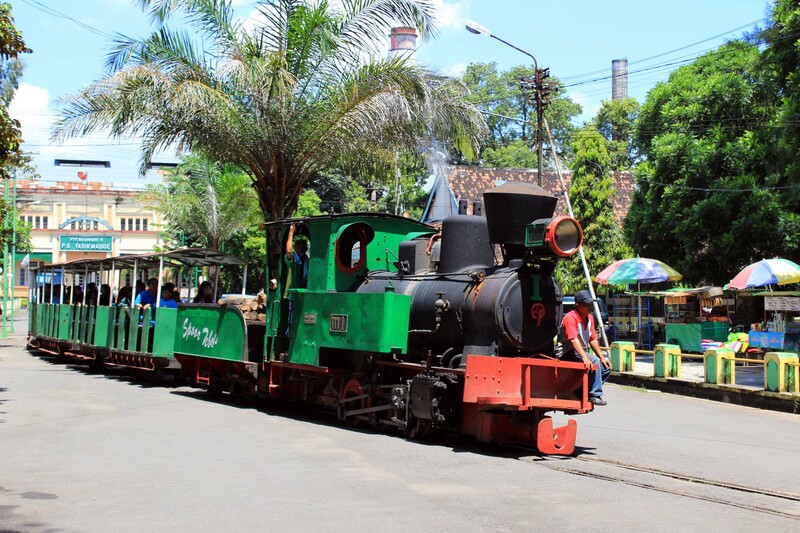 And unlike “Si Mbah” which was mainly employed for freight dutiest, this loco was exclusively used to haul VIP royal inspection train from Solo to here. 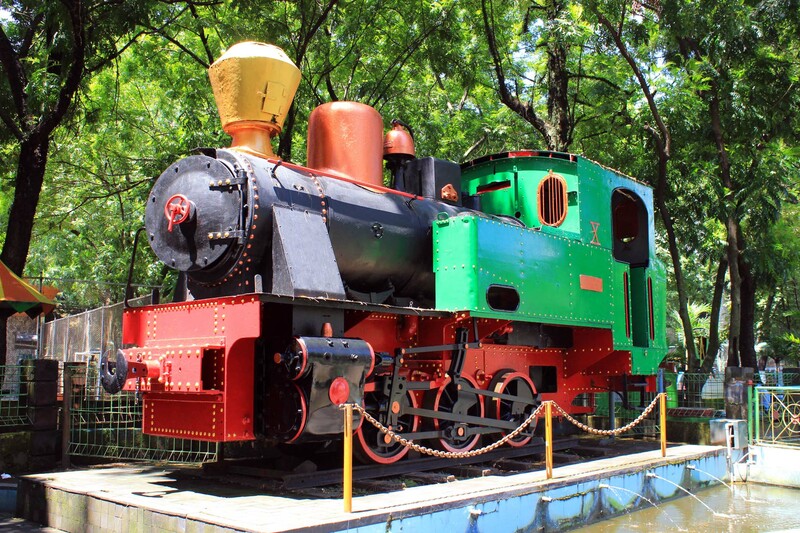 Of course the main attraction of this place is the real steam working around the theme park. 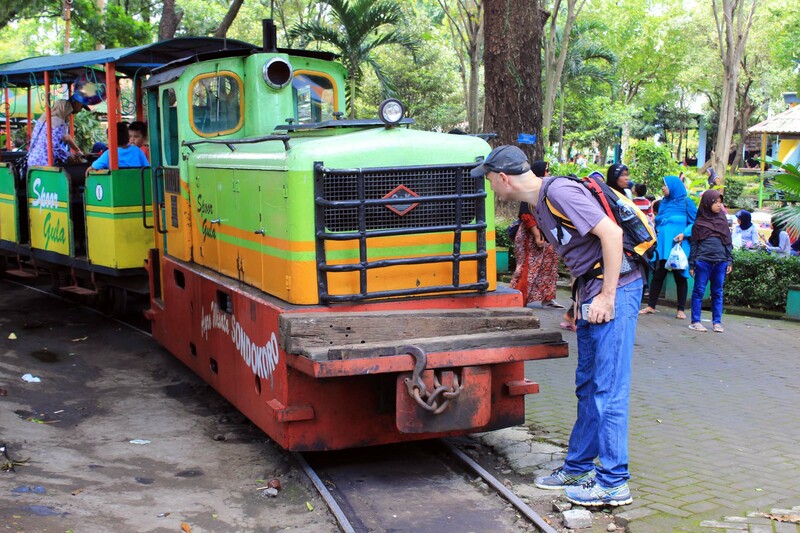 But Cristophe is not really interested with the steam loco, and keen to see the sole diesel loco used for the amusement train. 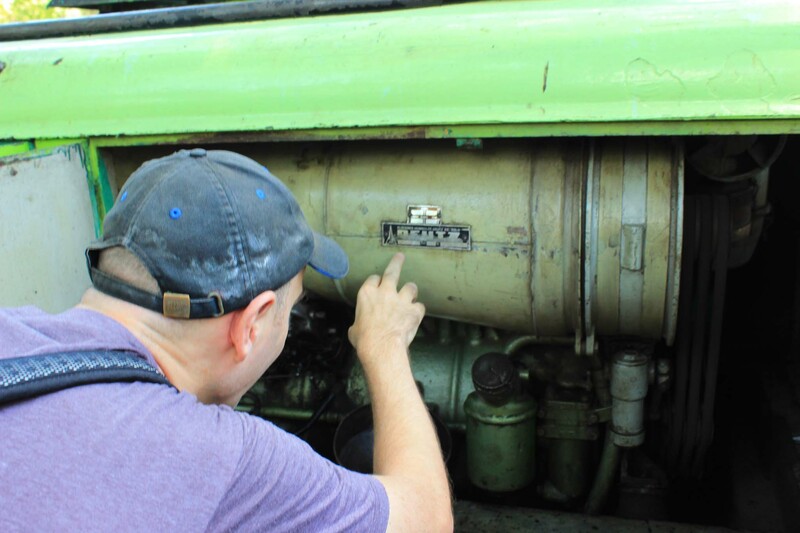 As we opened the engine compartment, we found out that this loco is using Deutz engine! This is an air cooled engine, so there is no radiator, and instead there is a large turbine which is used to pump in fresh air to assist cooling. Pak Megan introduced us to the head diesel mechanic who happens to be there. He is pretty much the expert of the diesel loco in here. He said that this loco is highly reliable. 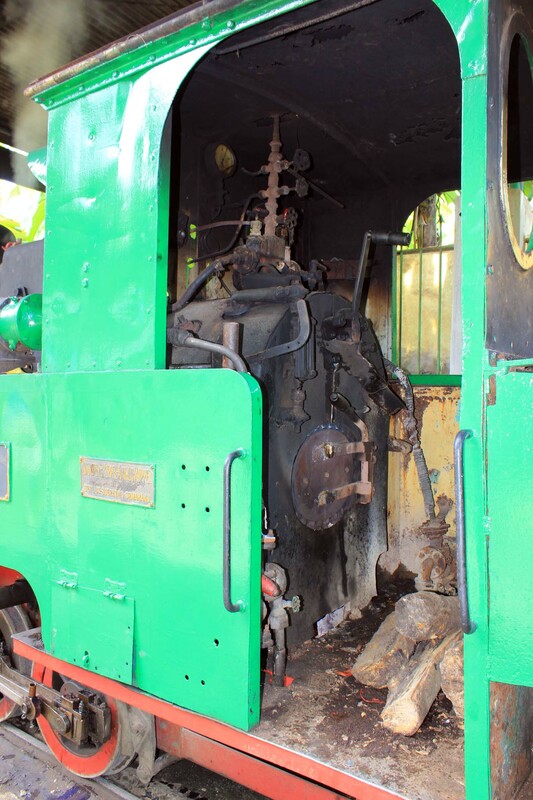 And maintaining the loco is not very difficult as the spare parts are easy to obtain. The exception being the wet clutch which is rather expensive and difficult to obtain. 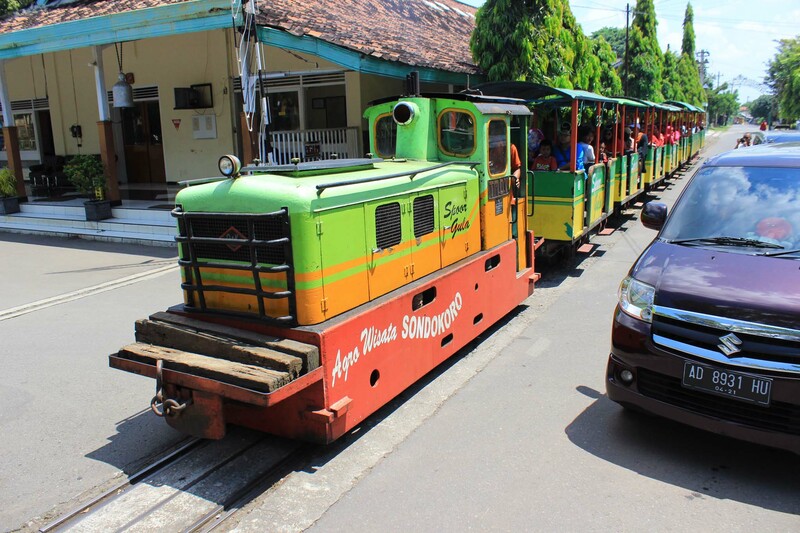 Contrary to popular belief that I heard in some sugar mills in East Java (some of them even still retaining their field lines) maintaining the old German diesel locos are not that difficult, their spare parts are readily available in the market and not costly to purchase. Then why do some sugar mills over there change the original European engines with Japanese ones with excuses such as cheap parts? The mechanic also told me that this 1966 built locomotive is robust and reliable. 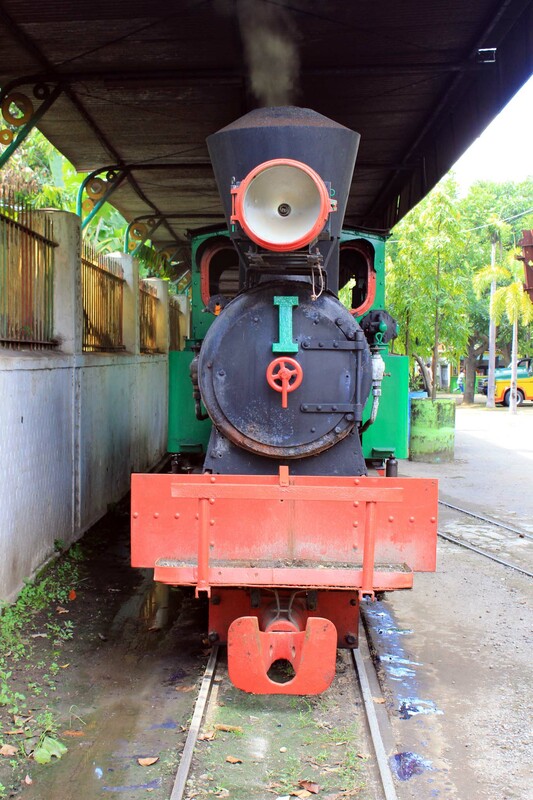 Had Tasikmadu field lines are still in place, this loco would have been the best choice (for diesel category) to work in the field. The fact that the loco can go run around for several times a day without any glitch is a proof on how reliable the loco is. Okay, now it’s time to get more serious. The first agricultural vehicle (of sorts) that we explore is this old steam roller. 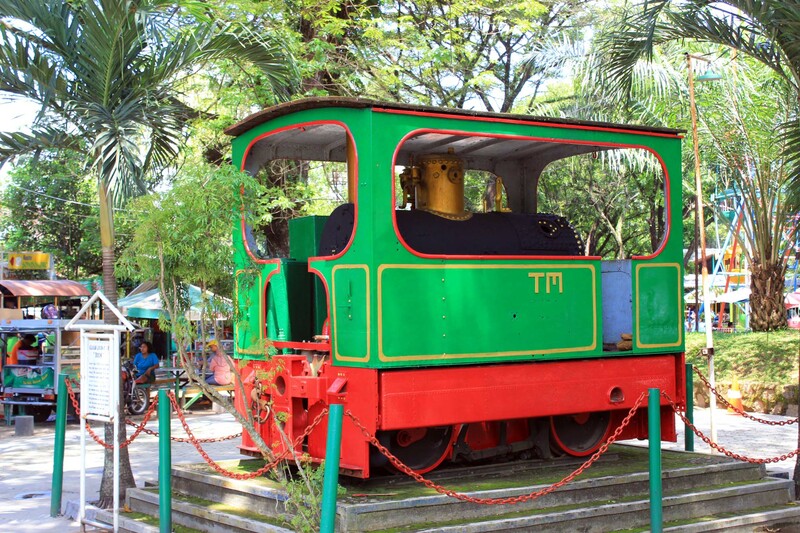 This vehicle wasn’t actually used for any agricultural activities around the Tasikmadu’s estate. Instead, it was used for road construction and repair, and possibly field lines roadbed construction. Christophe wasn’t too interested with this, and asked if there are any other old agricultural vehicles around here. Pak Megan showed us there is one tractor which is claimed to be the oldest in the mill. 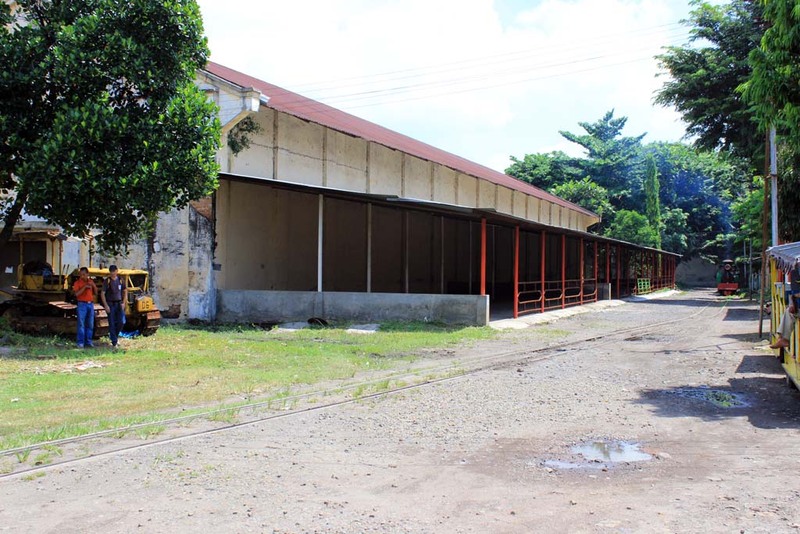 He said that the mill itself doesn’t possess any tractors as they are mostly owned by local farmers. And those too are mostly brand new products. We did see the vehicle which turned out to be a modified bulldozer. Although originally built for construction, it was occasionally used to assist harvesting activities. Christophe found that the engine is a Ford product which was built in 1960s. Age wise, it doesn’t meet Christophe’s expectation. It is ironic that in the place that I mostly proud of, our tour seemed to have gone downhill, in term of historic tractor research….. While we were busy investigating, we can hear steam whistle approaching. 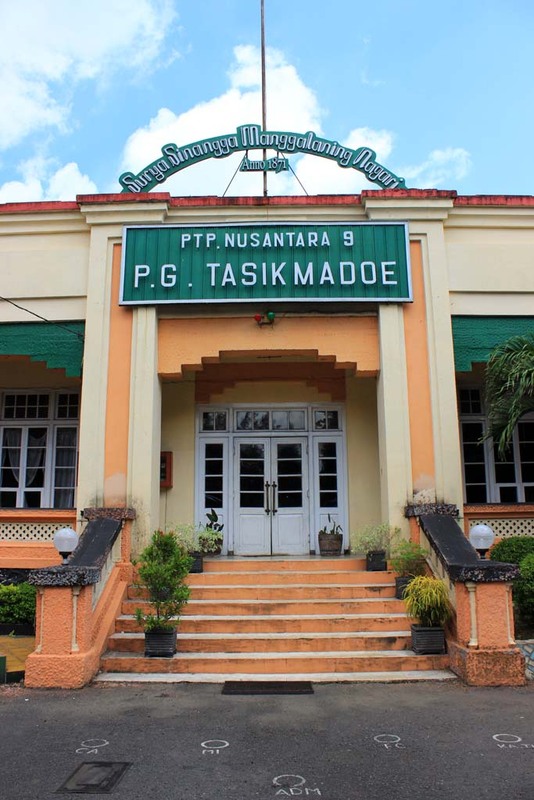 It was Tasikmadu I approaching. The fact that the mill is closed due to off harvesting season (and it was Sunday) prevented us from exploring much more inside. But at least the sight of passing diesel train does entertain Christophe. I have to say that the mill’s building is a majestic looking one. A stark contrast to other mills which largely resemble ordinary factory or just shed, Tasikmadu’s mill entrance is like a façade of a palace. Just right next to the entrance is the remnants of a locomotive boiler. 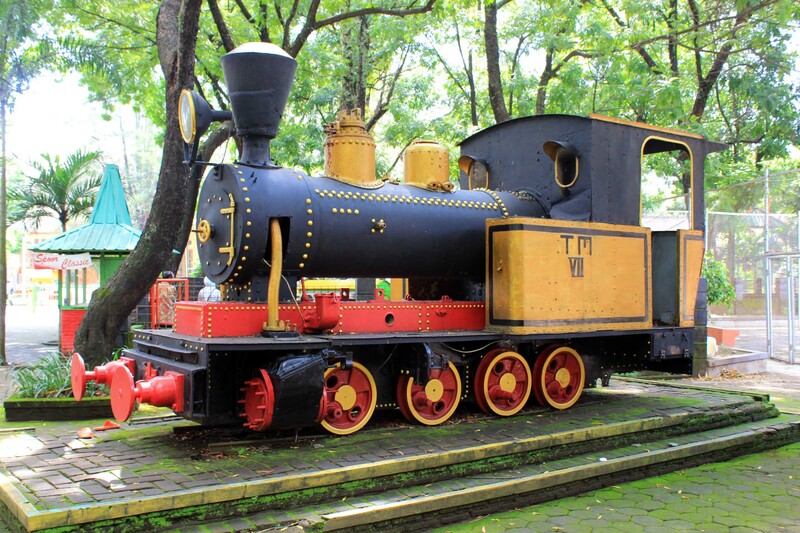 Pak Megan told us that this is the remains of a locomotive that was involved in a fatal accident in 1990. 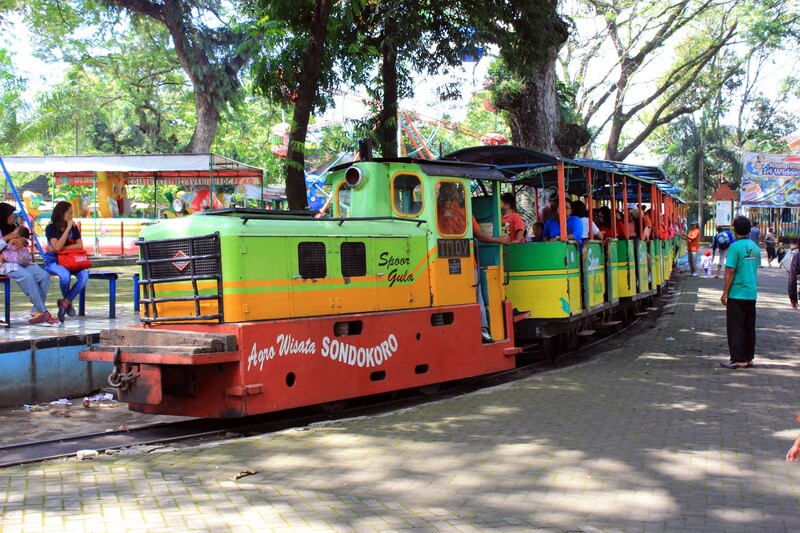 Ariawan explained further that the accident was caused when the driver lost control of the runaway train (as it was traveling downhill from Matesih). When the driver tried to made hard braking, instead of reducing speed, the loco flipped over and buried in sugarcane wagons pile ups. The driver perished when hot water from the boiler showered him. That’s truly gruesome! The accident was remembered as the darkest chapter in the mill’s railway history. 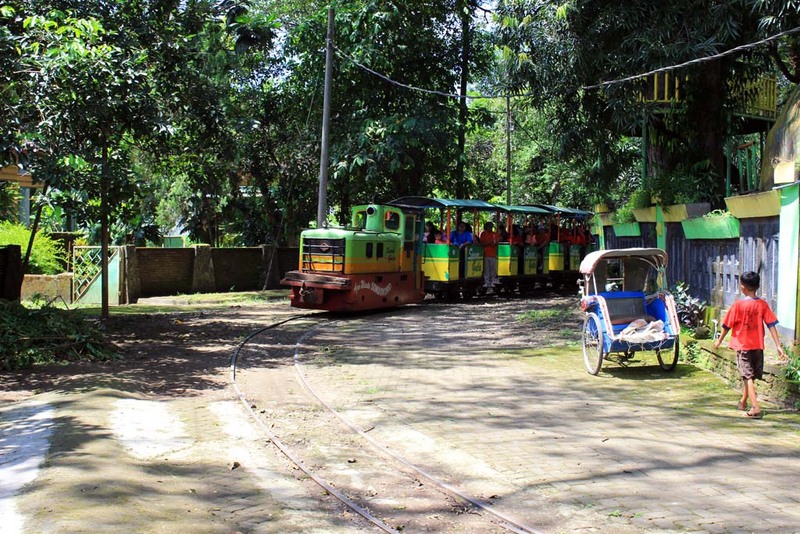 It didn’t just caused the loss of locomotive and life, but also hastened the closure of eastern field lines, which at that time amounted 40% of Tasikmadu’s field lines network! From there we head to the locomotive shed. 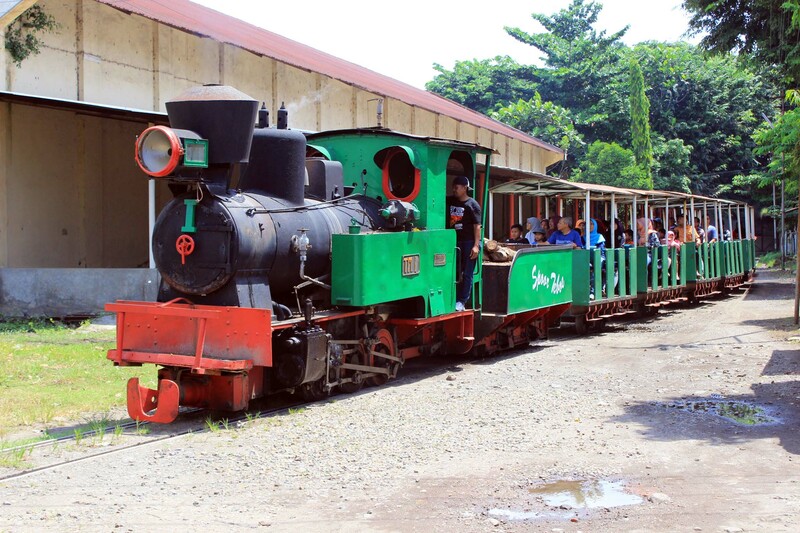 In Indonesian sugarcane railway world, the locomotive shed is called “remise”. Christophe said that the word is actually French in origin. It means storage shed or barn. 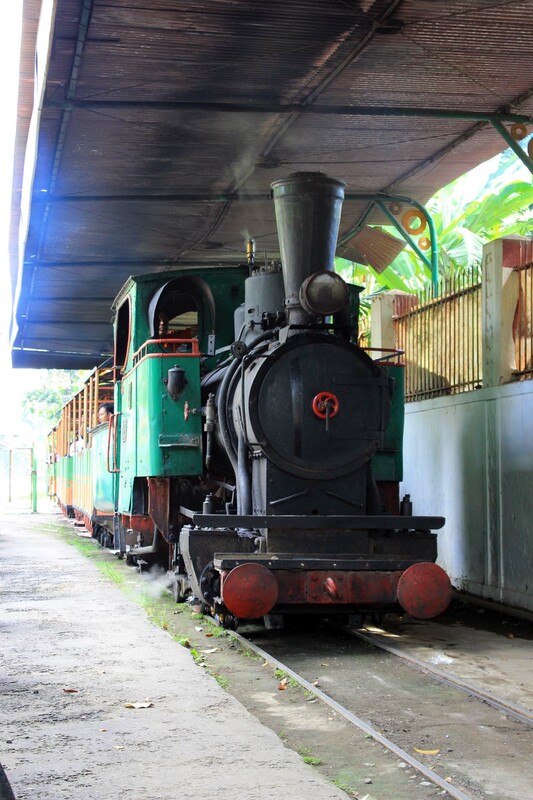 Since the main locomotive shed is locked, we can only see the locos from the outside. 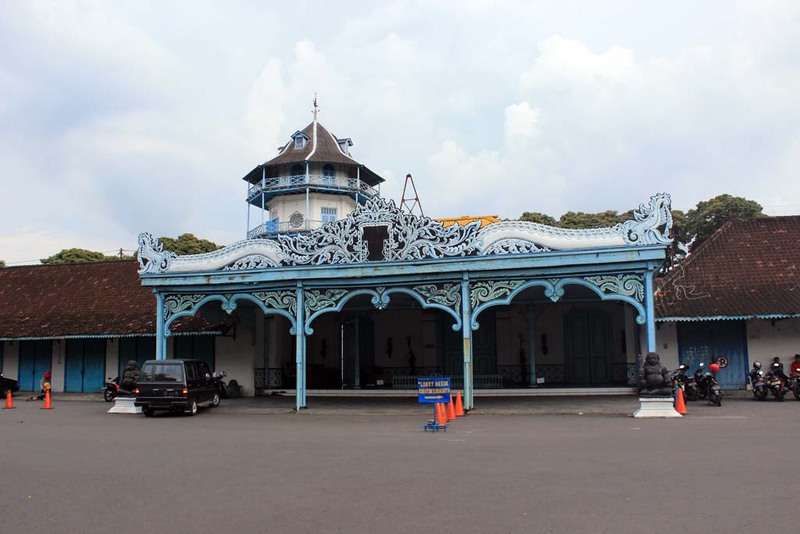 I also notice that apparently the art-deco shed building is actually dating back from 1951, not Dutch colonial era. 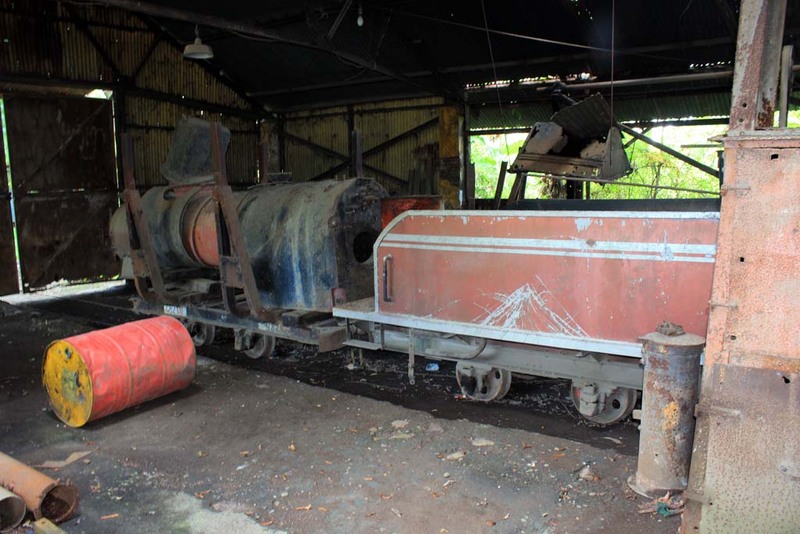 In the smaller loco shed, there are fewer things to see: just a small Schoema locomotive as well as the wreck of De Couillet steam locomotive which was scrapped in late 2014. Christophe giggles upon hearing the name. He said that in France the word “De Couillet” is the slang for “small genital”! Well, it is obvious that there no more interesting objects to be seen for Christophe’s research, so we decided to return back to the city. 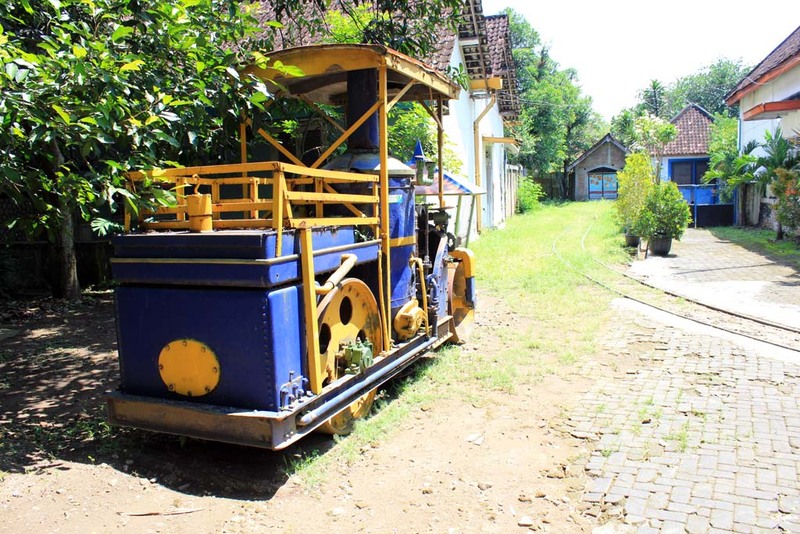 As we walked back to the car park, we encountered this Tasikmadu I which is parked near the shed, waiting for its duty hauling amusement train. A few minutes later, a whistle can be heard in the distance, and the Borsig-built no.3 is approaching from ahead. So the driver of loco no I had to put the train in a spur nearby to allow this train to pass through. Trailing behind this train, apparently there is one interesting looking vehicle: a track inspection vehicle! 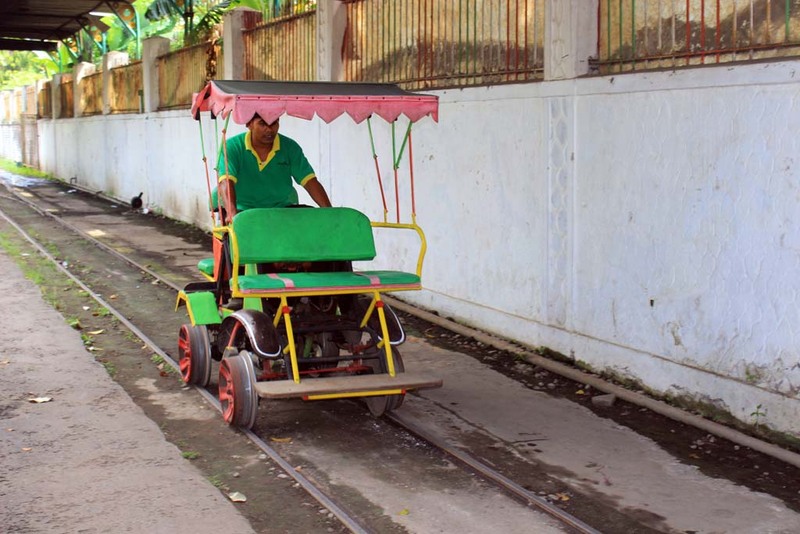 Nicknamed “becak rel” due to its resemblance to rural tricycle taxi, this vehicle was used to inspect railway track condition, especially when the field lines were in operation. As the field lines were closed, the mill management decided to dump this vehicle. In fact when I visited Tasikmadu in 2014, it was in dump yard. In 2015, the vehicle was recovered and brought back to operating condition. 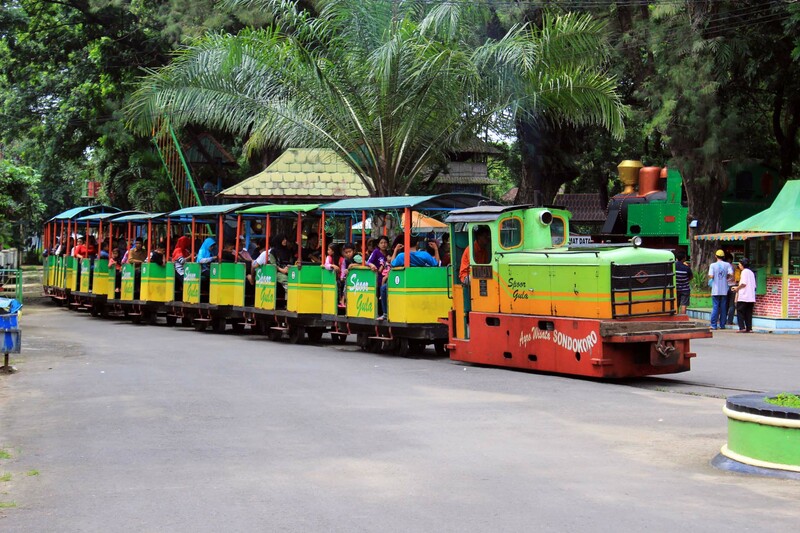 Although now it’s only used for recreational vehicle, as plan to reopen Tasikmadu’s field lines for tourist train has yet to materialize. 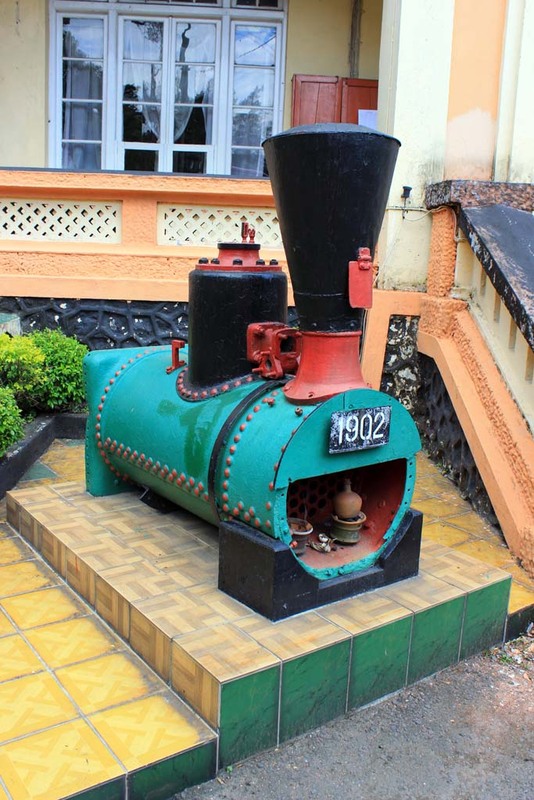 As we walk back to the car park, we also see some interesting things such as this Tasikmadu VII locomotive which is unfortunately painted in gold color. We also catch the last glimpse of this Orenstein & Koppel diesel whom Christophe likes the engine sound very much. He said it reminds him to his father’s tractor. 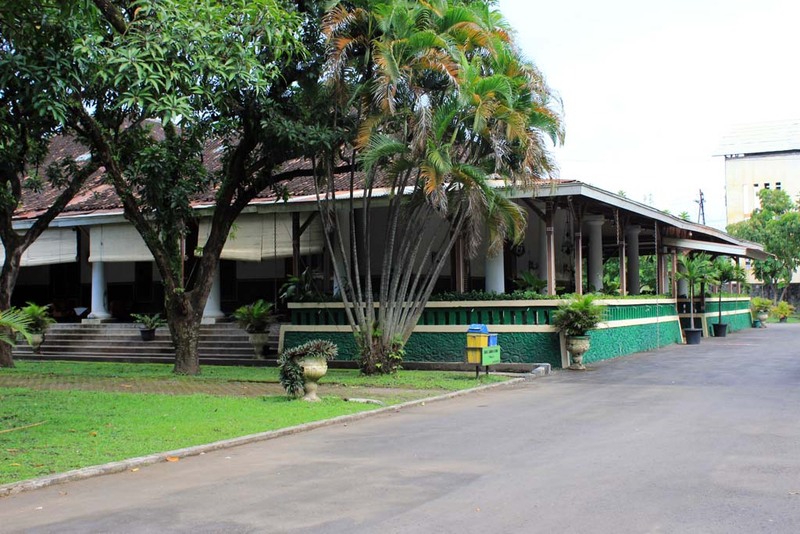 Our car is parked just in front of “Besaran” or Manager’s mansion, which is now used mostly as employee’s dormitory. 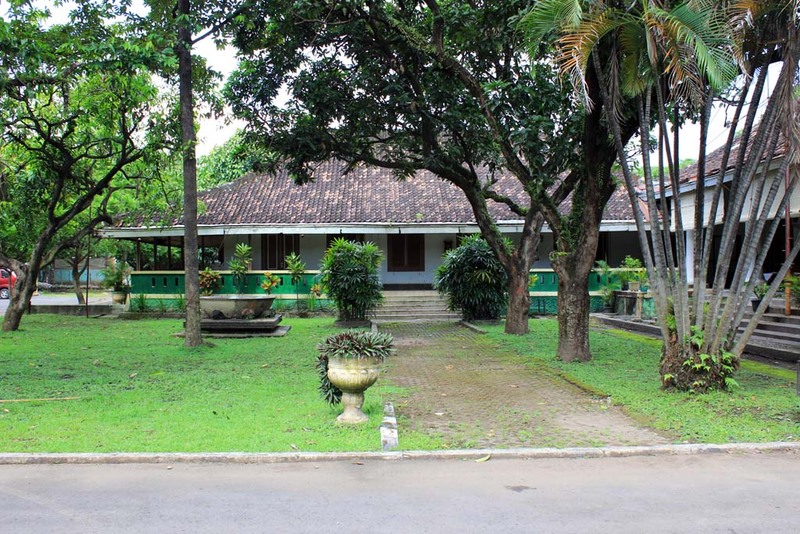 I really love its old colonial style, and it’s good to know that it is still well maintained. We bade farewell to pak Megan, and Ariawan, and head back to the city. 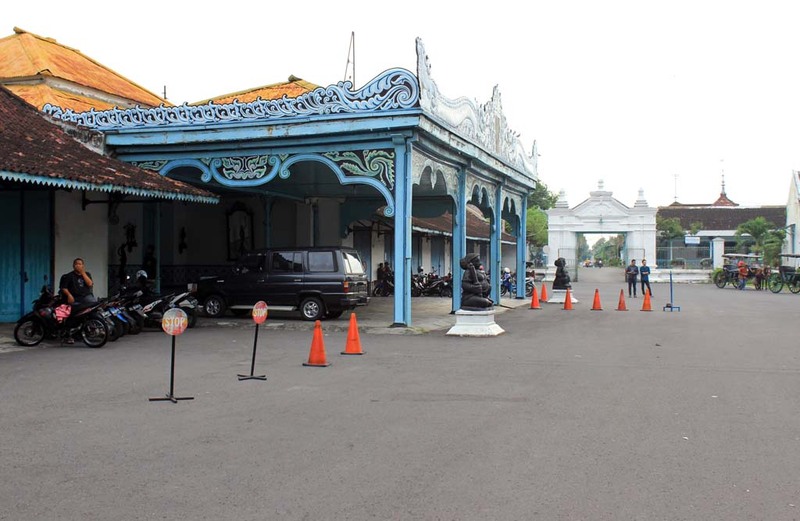 Upon arriving back, we took a lunch at this famous eatery which is located right in front of Mangkunegaran Royal Palace. I had eaten in this restaurant before, but this time I brought my DSLR along as in previous visit my camera was not working. 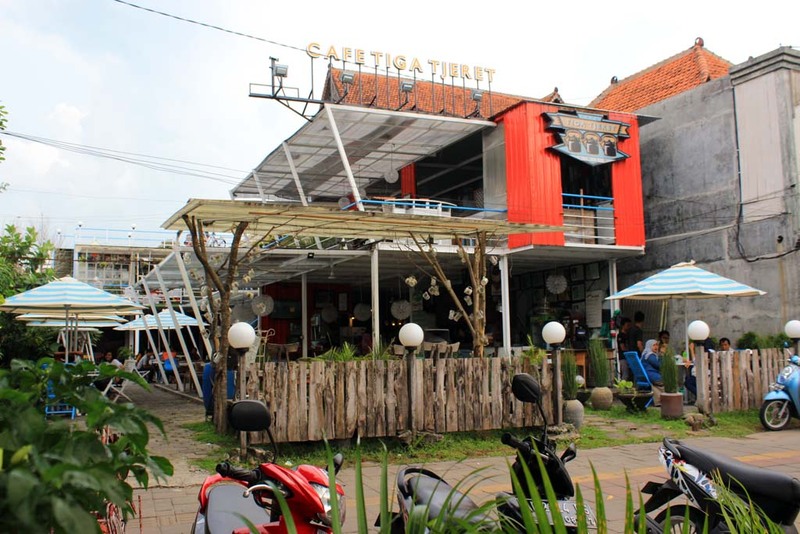 Despite of its “Café” tag, it is actually a restaurant which sells traditional lower middle class food repackaged to appeal upper middle class. Unless that they also provide free Wifi (only for customers who buy significant amount of food), for anyone who wants to sit and surf the interenet. 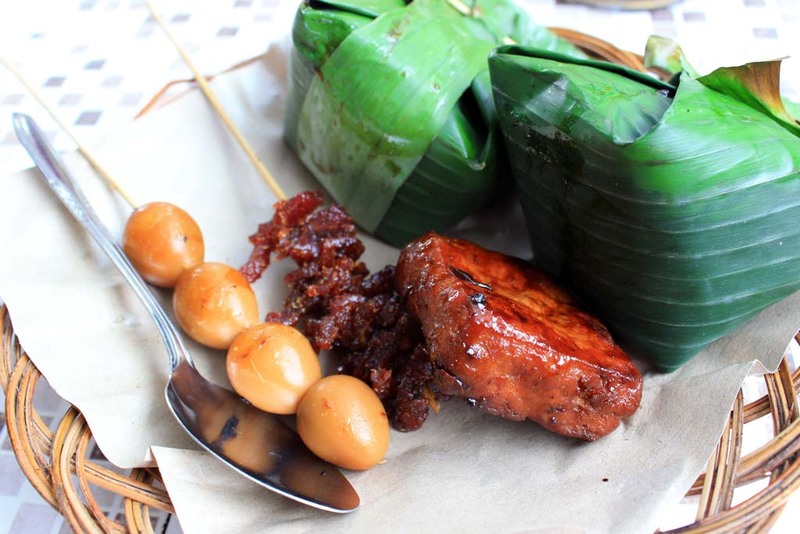 The concept of this restaurant is similar to traditional Solonese food, where you are offered variety of rice serving, and then you take side dishes of your choice. Unless in here they warm any food items that you take first in griller before serving them to customers. I took 2 packets of rice with beef black pepper, and with side dishes of quail egg, sweet beef jerky, and caramelized spiced tofu. They are very satisfactory when it came about quality, but rather modest in quantity. After we finished our lunch, we went around the city to kill time before sunset. 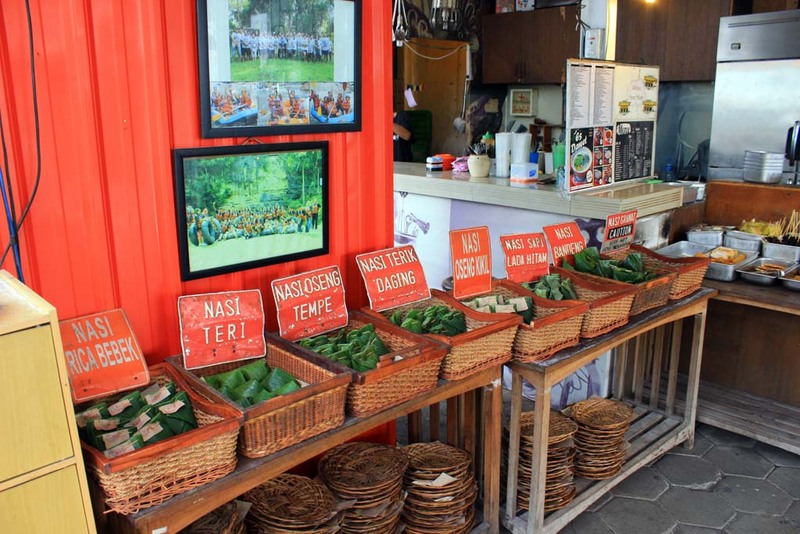 We decided to see some interesting places around the city of Solo, such as pawn shops at Triwindu market, and Laweyan batik district. In both places, we didn’t buy anything, and we didn’t even set down to have a look around in Laweyan. To conclude our today’s tour we also visited Solonese royal palace. At the height of their power, the area around the royal palace was a restricted area and inaccessible by commoners like what it is now. 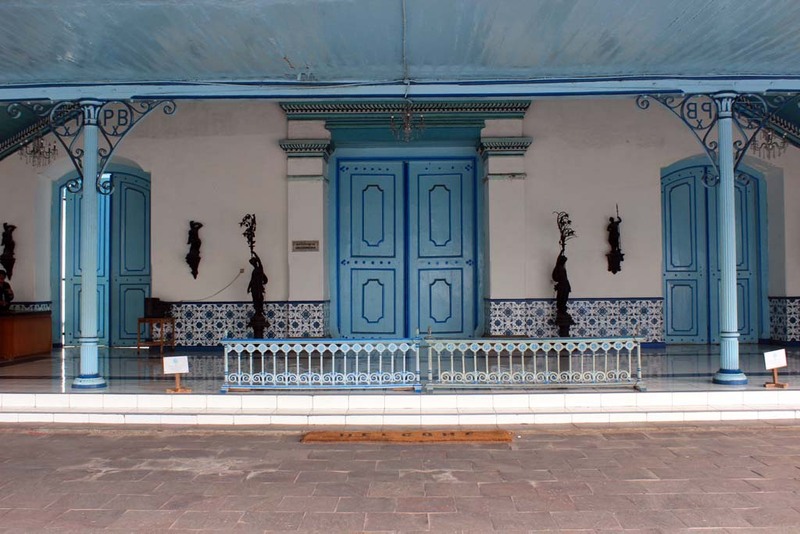 The Solonese royal family is one of 2 royal families who live in Surakarta, the other being Mangkunegaran. 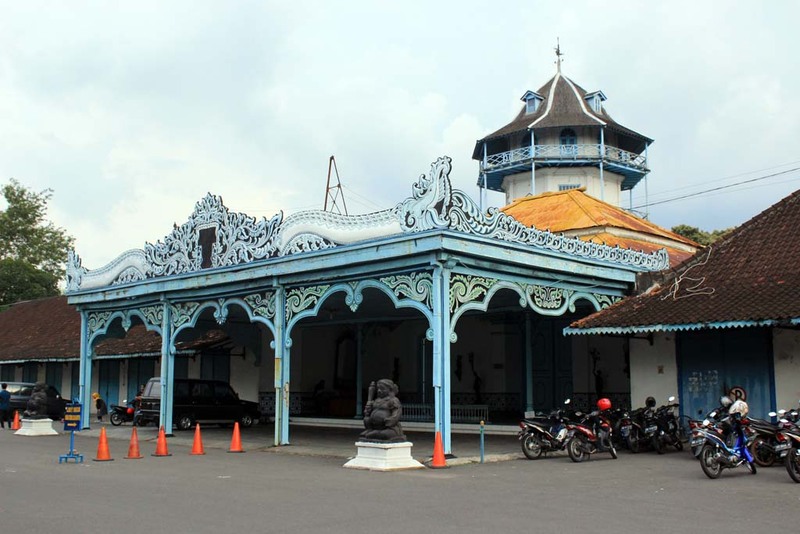 In fact the Solonese sultanate came into being as a result of Giyanti Treaty in 1755 which ended Mataram kingdom as a fully sovereign state, and dividing the kingdom into Surakarta and Yogyakarta sultanates. 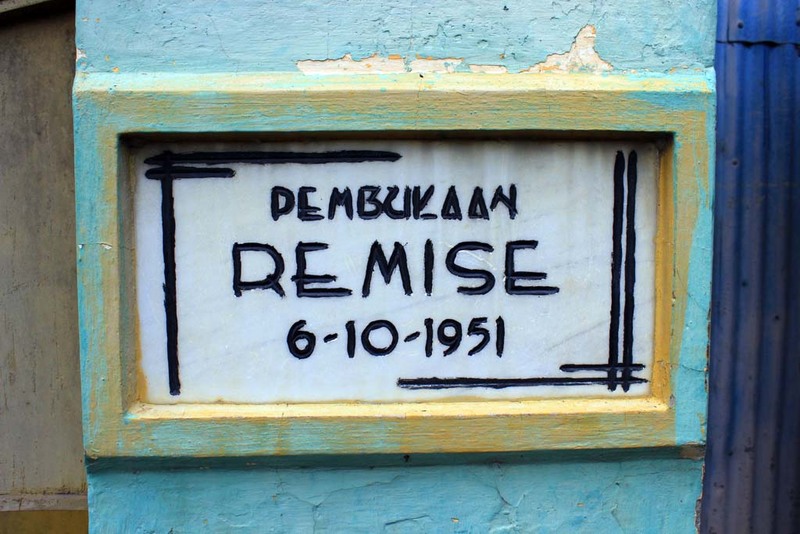 Unlike their Yogyanese counterpart (at one point in history they were rival) Solonese royal family no longer bear true power, and their position in Indonesia’s politics are purely symbolic. A few years ago, this Sultanate was embroiled in power struggle scandal. After the death of their king, Pakubuwana XII, two of his eldest sons (Suryo Partono and Tedjowulan) claimed to be the rightful claimants of the throne. As the deceased king did not designate replacement, or having queen consort (both of his eldest sons were born from different concubine mother) this eventually led to a family feud which briefly made headline in 2004. 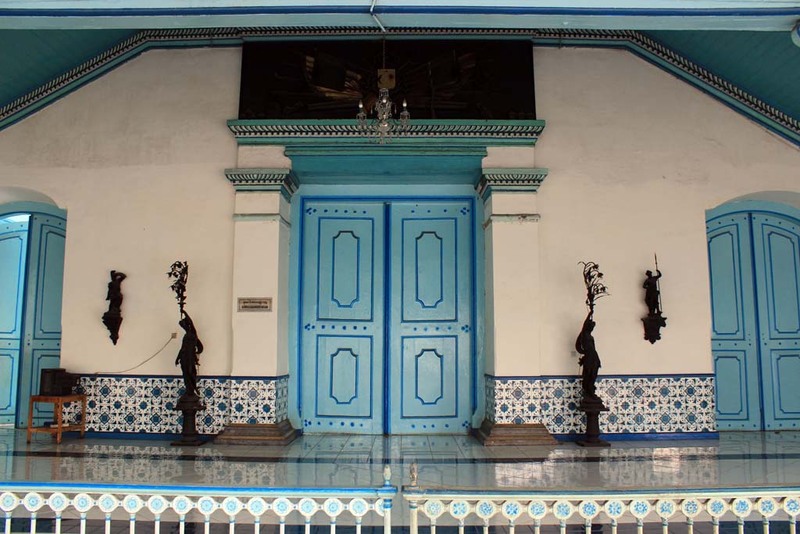 After some negotiations, which were mediated by central government in Jakarta, it was eventually decided that Suryo Partono is the rightful heir to the throne, and he was eventually crowned as Pakubuwono XIII. Although it was a small scale scandal, by national level, it was pretty much damaging Solonese sultanate reputation. After Indonesian independence, the Sultanate was often accused for being Dutch collaborator, which was later proven to be untrue. So this feud really added their misery, after being stripped of their Special Region status in 1946. 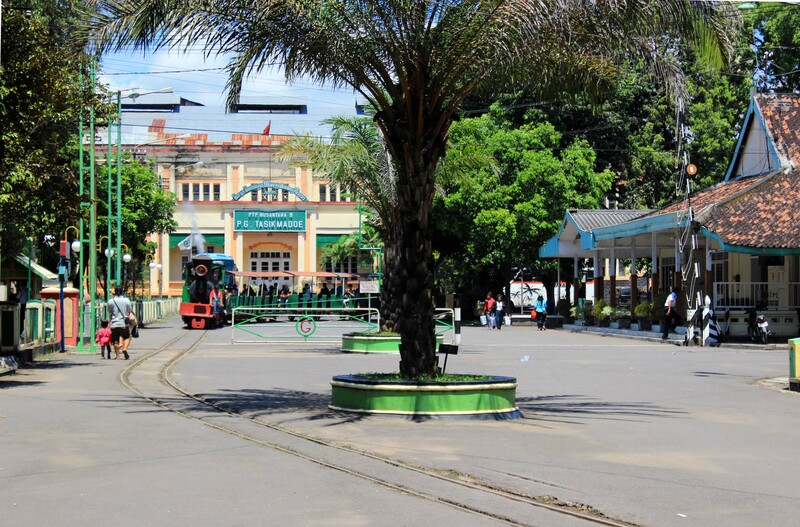 Some say the accusation were made by communist group in nearby Madiun who seen a sovereign royals as a threat of their increasingly volatile activities. Although the communist rebellion was eventually crushed in 1948, Solo sultanate has never been granted special territory (like what their Yogyanese counterpart has) ever since. Nevertheless, Solonese royal palace is a worthy place to visit if you happen to come to this ancient royal seat. The façade of the palace is equally impressive. 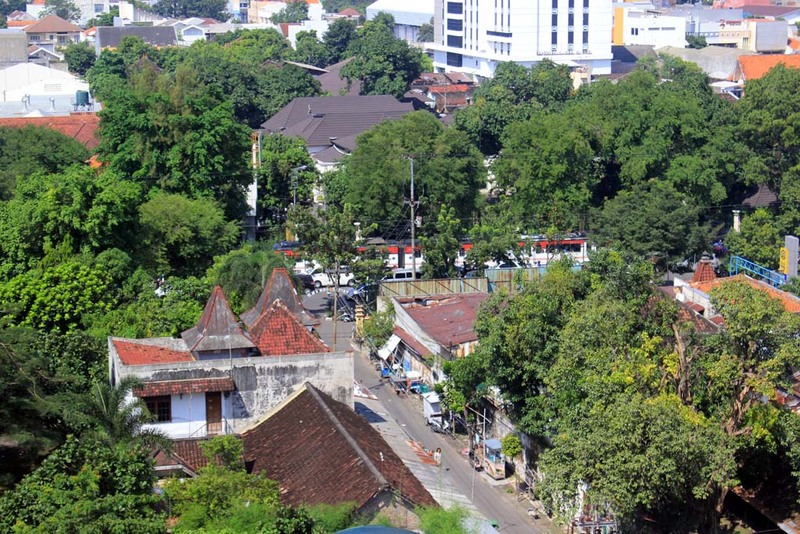 Just behind it is a tower named “Panggung Songgo Buwono”. 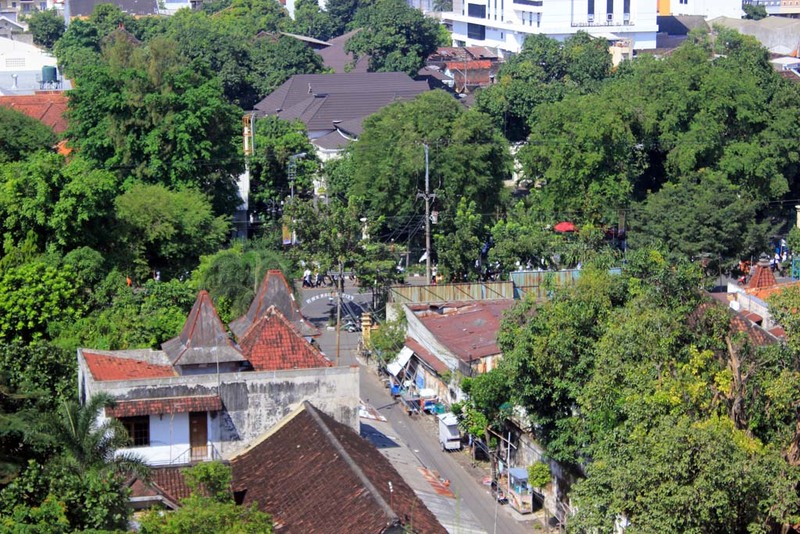 Up until 1970s it was the tallest structure in Surakarta. It was said to be used by past royals to meditate, and also monitoring Dutch military activities at the now largely demolished Fort Vastenburg citadel. At the conclusion of today’s tour we returning back to our hotel for rest and relax. Unlike previous night, where we ate together in the hotel, tonight I decided to explore a bit of culinary in the city. My friend Ariawan told me that there is one nice seafood restaurant just a few hundred meters from the hotel. So I decided to give it a try. The restaurant is just a modest lower middle class restaurant. 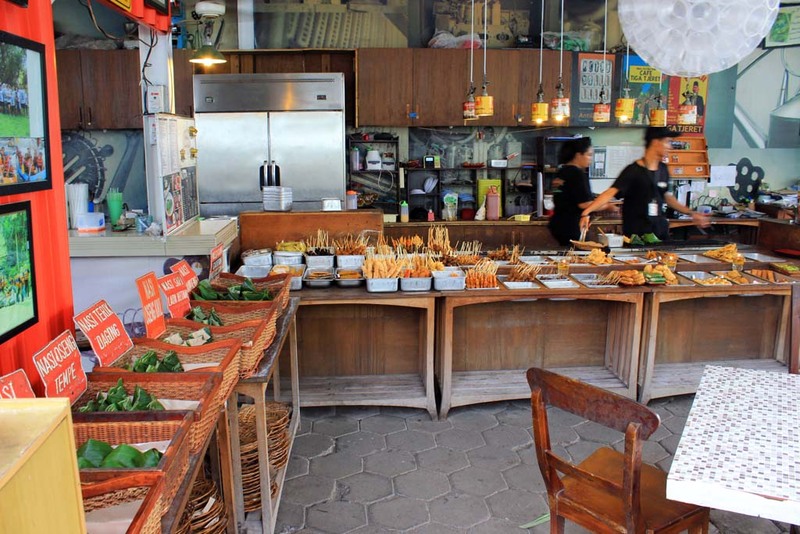 But the seafood is authentic, and they have a good variety of menu. 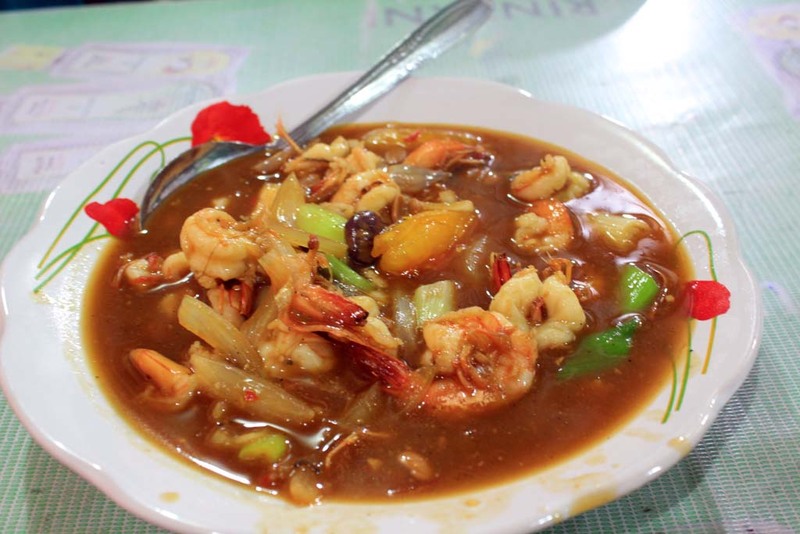 I ordered Shrimp in Tauco sauce (tauco is a sauce made from fermented soy bean). The food tasted….oh well, I should have asked them not to add tomato because it spoiled the taste. But overall it is a delicious and tasty food, and it is a highly recommended place to visit. I would love to come again, although I may order food without tomato in it. After I finished my meal, I went to do some shopping in nearby supermarket, to buy some provisions for tomorrow, and then heading back to hotel for rest and relax.